Amanda Michel has been playing the piano for 15 years. Music has always played an important role in her life. Originally from Innisfail, she took piano lessons from Janet Brown for 10 of those years. After being inspired by Mrs. Brown to create a career for herself in the field of music, Amanda went on to obtain her Music Diploma from Red Deer College, completing the two-year program in 2008. 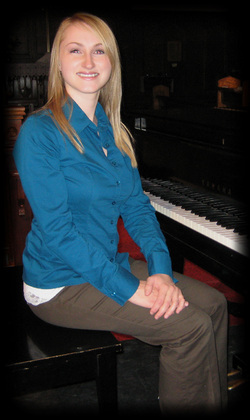 Majoring in Classical Piano, her private instrument study was completed under the direction of Dr. Dale Wheeler, and she also took music history and theory lessons, a chamber ensemble class, participated in numerous opportunities to accompany vocalists, and sang as an alto in the Red Deer College Chamber Choir. Amanda also holds her Grade 10 Piano Certificate from the Royal Conservatory of Music, along with her Grade 4 History and Grade 4 Harmony Certificates. After moving to Fairview, Amanda decided to follow her intuition and currently teaches piano and theory from her private home studio. She is continuing her music studies with Lois Alexander, working towards receiving her ARCT in Piano Pedagogy and is working on her Elementary Pedagogy at present. Please call for information about piano and/or theory lessons at Amanda Michel's Studio of Music and to set up an interview.